Lately I have been grating fresh ginger + adding it to my tea, not only because it gives it a bit of a spicy kick but it is so good for you. In traditional Indian Ayurvedic medicine ginger is given the status of virtual medicine chest, capable of healing almost anything that ails you. There are so many uses but these are just a few that got my attention . Ginger improves absorption and assimilation of nutrients in the body + helps with digestion. It is a proven anti-inflammatory, so it helps with pain. If you are feeling a little blue it is said to help your mood, it is great when you are feeling congested or have a cold. 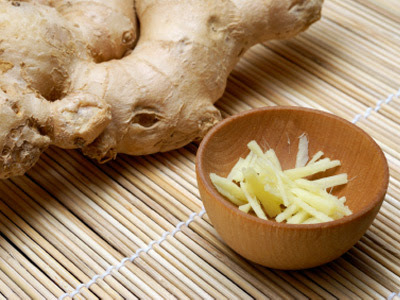 If you are feeling nausea or have a stomach ache chew on a little ginger to feel better. There are so many ways to use ginger in your diet my favorite is either added to your favorite flavor of tea or this simple ginger tea recipe...simple, sweet + so satisfying.